In the fourth book of Steven L. Layne’s Growing with Family Series, he captures a child’s longing for a pet and introduces the realities of owning one. 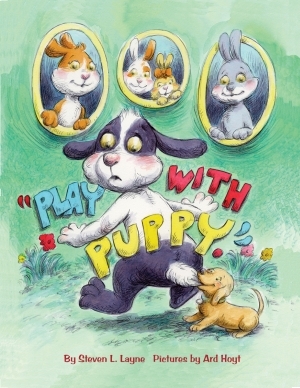 Ard Hoyt’s playful illustrations provide a hilarious look at Puppy’s antics page after page providing a story within the story. Brother is excited to get his new puppy but he soon tires of the Puppy’s boundless energy. Puppy wants to play all the time! Even worse, Puppy gets into things that Brother has to clean up. Sick and tired of everyone telling him to go “play with puppy,” Brother tells Puppy to go away. What will he do when Puppy actually disappears? Find out in this colorful picture book for the very young. Dr. Steven L. Layne holds degrees in psychology and education from Judson University, where he is professor and chair of graduate programs in literacy. He is the author of over thirty books, including two International Literacy Association/Children’s Book Council Children’s Choice award winners. Ard Hoyt graduated from the Art College Center of Design in Pasadena, California with a major in illustration. His illustrated works have hit the New York Times bestseller list and garnered such awards as the ASPCA’s Henry Bergh Children’s Book Award.